The terrorist attacks of September 11, 2001, constituted a watershed event in American history, particularly for law enforcement. In the aftermath of that event, the nation's principal law enforcement officer, the attorney general, introduced new measures designed to prevent and combat terrorism, while the leading U.S. law enforcement agency, the Federal Bureau of Investigation (FBI), increasingly turned its intention toward terrorism. Through its Community Oriented Policing Services (COPS) program, which provides assistance and coordination to first responders at the local level, the Justice Department has helped state, county, and municipal forces respond to terrorism. The agencies have in turn developed a myriad of programs to improve intelligence collection and processing, increase the capacity to address terrorist acts, communicate with other public safety agencies, and respond to citizen fear while assisting victims. Following the attacks, Attorney General John Ashcroft drafted legislation known as the U.S. Patriot Act, which President George W. Bush signed into law on October 26,2001. Controversial among civil libertarians, who regarded it as an erosion of freedoms, the 342-page bill contained changes to some 15 different statutes. Collectively, these changes gave the Justice Department and its agencies a number of new powers in intelligence gathering and criminal procedure against drug trafficking, immigration violations, organized criminal activity, money laundering, and terrorism and terrorism-related acts themselves. 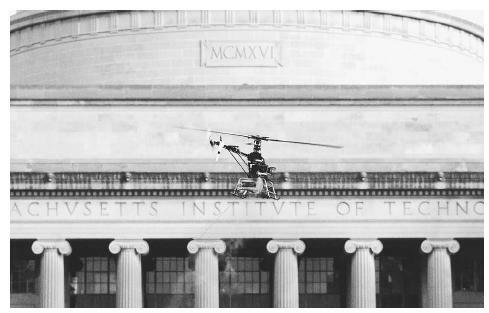 A 17-pound miniature helicopter created by a group of researchers at the Massachusette Institute of Technology in 2002 could have future uses for civilian or military surveillance, shooting aerial camera footage, or scouting disaster areas and other dangerous terrain. information; reduced bureaucracy by allowing investigators to use a single court order for tracing a communication nationwide; and encouraged sharing of information between local law enforcement and the intelligence community. Prior to the Patriot Act, federal law had sharply limited the ability of prosecutors and law-enforcement officials to share investigative information with other federal officials, let alone local ones. Thanks to the Patriot Act, sharing would increase between intelligence organizations such as the Central Intelligence Agency (CIA), whose purview is international; the FBI, whose area of focus is domestic; and first responders, whose focus is the community. Such information sharing, it was hoped, would prevent information from falling through the cracks. Allegations made by several special agents against their employer, the FBI, provided an example of the problems that occurred prior to the implementation of such information sharing. In July, 2001, Special Agent Kenneth Williams of the Phoenix FBI office sent his superiors a memo warning that Arab males with possible links to terrorist leader Osama bin Laden were training at an Arizona flight school. The bureau rejected his pleas for an investigation. Around the same time, Special Agent Colleen Rowley of the Minneapolis office requested a warrant to conduct wiretaps and a computer search against an Arab trainee at a local flight school who had aroused suspicions when he told instructors that he only wanted to learn how to fly a plane, not how to land it. He was arrested for immigration violations in August, but still the bureau took little interest in Zacarias Moussaoui. Only after the September 11 attacks did authorities search the computer of the so-called "20th hijacker," at which time they found phone numbers that might have led them to Moussaoui's alleged coconspirators. A new focus on counterterrorism. The problem with the FBI was not incompetence or ignorance; rather, prior to September 2001, its mission had been strictly that of a lawenforcement agency. Its job was primarily to solve crimes that had already occurred, not to collect intelligence concerning terrorist attacks and other crimes that had yet to take place. Nor did it work closely with the CIA, because their missions were different, the one concerned with domestic affairs and the other focused on international concerns. In the wake of September 11, Ashcroft and FBI Director Robert S. Mueller III refocused the bureau's efforts toward counterterrorism. In December, 2001, Mueller announced plans to reorganize headquarters by creating new counterterrorism, cybercrimes, and counterintelligence divisions; by modernizing information systems; and by emphasizing relationships with local first responders. Criticized for not taking enough measures to direct the bureau toward its new mission, Mueller in the spring of 2002 announced a number of new reforms. These included the hiring of more analysts; the re-tasking of special agents to counterterrorism; the creation of an intelligence office; development of terrorism expert support teams to work with the bureau's 56 field officers; recruitment of Arabic speakers and others fluent in Middle Eastern and South Asian languages; creation of a joint terrorism task force to coordinate with the CIA and other federal agencies; and the improvement of financial analysis and other forms of strategic analysis directed toward terrorist groups. Even as the nation's law enforcement leadership worked to refocus efforts toward combatting terrorism, the Justice Department had already put in place a program that greatly assisted local law enforcement in responding to terrorist acts and threats. This was COPS, which was already in place in September, 2001. COPS has helped local forces to strengthen their response to terrorism by improving data and intelligence collection and processing, capitalizing on technology advancements, encouraging communication with other public safety agencies, and helping local agencies to respond to citizen fear and prepare to assist potential victims. As noted in a 2002 report on COPS programs, "Of course, these approaches are only one piece of the equation. A successful response to terrorism involves an array of activities, many of which are reliant on human intelligence gathering activities and productive partnerships between local law enforcement and other agencies." Still, COPS and similar federal programs have served to greatly improve the abilities of local forces to respond to situations. While each community force remains distinct, federal involvement increases the degree of coordination in activities. Local forces have at their disposal a number of tools for managing data and intelligence, including in-field laptop computers, computer aided dispatch systems, enhanced records management systems, geographical information systems (GIS), and 311 phone systems. The last of these is aptly characterized by the tagline used to promote it in Chicago—the city's " other help line." In contrast to 911, the number set aside purely for emergencies, 311 is for non-emergency calls to police, and for answering citizens' questions. An example of an integrated information management system at the local level is the crime analysis workstation developed in Seattle through a 1997 COPS grant. Included in the station is crime-mapping software that can be used for traditional crime analysis (e.g., to detect patterns of burglary in a neighborhood), or adapted for emergency mobilization as in a terrorist situation. Under such conditions, peace officers might consult it to locate critical facilities such as fire stations and hospitals, or to provide emergency mobilization maps to all officers on patrol. Crime mapping and information management can also be used to protect against terrorism, often by integrating law enforcement data (e.g., arrests, citations, and accidents) with non-law enforcement data such as financial and credit records, census information, tax and license registrations to businesses, and so on. Also included among varieties of non-law enforcement information is geographic data such as aerial photographs, floor plans, three-dimensional images of buildings, zoning and parcel information, and sewer and water systems. By using such materials, authorities might, for instance, obtain information on companies such as plant nurseries or farm supply stores that serve as potential repositories for ammonium nitrate fertilizer, an ingredient used in many explosive devices. If a burglary were to occur at one of these facilities, this law enforcement information could be combined with the non-law enforcement information obtained earlier to track the possible use of ammonium nitrate for terrorist purposes. Similarly, if officials tracked a sharp increase in sales of flu medicine at drug stores, this might indicate that a biological attack had taken place. Use of GIS applies geography, not so much to track criminal activity as to minimize and manage crises. Geographic information can be used to predict risks, and decrease loss of life and property, in the wake of a terrorist attack. It can also be used to develop target inventories and specific incident response scenarios, as well as to map out potential citizen evacuation routes. Use of GIS in integrated systems can enhance the coordination of law enforcement responses to crises. In 1998, COPS provided a grant to Broward County, Florida, which used the funding to develop a means of information-sharing between local authorities and nonlaw enforcement first responders, such as firefighters and hospital emergency response teams, as well as law enforcement officials outside the local area. The Broward program included in-car mobile data computers and a county-wide computerized dispatch system. Encompassed within this larger initiative was Operation Safe Schools, a software package provided to all first responders, which made possible the quick retrieval of floor plans, interior photographs, contact names and phone numbers, and evacuation routes for local schools. In July, 2002, Representative Jim Saxton of New Jersey introduced the Law Enforcement Partnership to Combat Terrorism Act, designed to designate 25 percent of COPS funding toward intelligence programs. The move was another sign of the growing responsibilities placed on law enforcement in the post-September 11 world. Since September, 2001, law enforcement has been encouraged, on the one hand, to be on the lookout for terrorists, but on the other hand, it is tasked with upholding the civil rights of persons unfairly targeted with suspicion. In the wake of the terrorist attacks, some civilians took it upon themselves to threaten, harass, or cause harm to persons of Middle Eastern descent or the Muslim faith. Along with these were other persons from south Asia who had no connection either to Islam or the Middle East. It is the role of police to prevent such hate crimes, and to enforce laws against them. Similarly, law enforcement officers play a role in maintaining public calm, restoring order, providing a visible law enforcement presence, and answering requests for information and assistance. For the latter purpose, COPS in 2000 funded the National Center for Victims of Crime (NCVC), which operates a help line and distributes information cards. After September 11, the NCVC distributed half a million trauma information cards. Not just the NCVC, but the entire system of incident response in the United States has been retasked since September 11, 2001. More than ever, first responders—law enforcement, firefighters, hospital emergency personnel, and others—will work together, as will agencies at the federal, state, and local levels. This integration of efforts will also see increased cooperation involving agencies whose role in upholding public security is not widely recognized by the general populace. Among these are the Environmental Protection Agency and the Nuclear Regulatory Commission, which, along with the Federal Emergency Management Agency and the Coast Guard, are involved in situations involving chemical, biological, and/or nuclear hazards. Campbell, Kurt M., and Michele A. Flournoy. To Prevail: An American Strategy for the Campaign Against Terrorism. Washington, D.C.: CSIS Press, 2001. Chapman, Robert, et. al. COPS Innovations: A Closer Look: Local Law Enforcement Responds to Terrorism: Lessons in Prevention and Preparedness. Washington, D.C.:U.S. Department of Justice Office of Community Oriented Policing Services, 2002. Eggen, Dan, and Jim McGee. "FBI Rushes to Remake Its Mission: Counterterrorism Focus Replaces Crime Solving." Washington Post. (November 12, 2001): A1. Introduction of the Law Enforcement Partnership to Combat Terrorism. Federation of American Scientists. < http://www.fas.org/irp/congress/2002_cr/h072902.html > (April 29, 2003). Resources for Law Enforcement. Anti-Defamation League. < http://www.adl.org/learn/additional_resources/default.asp > (April 29, 2003).